Zimbra – Logix InfoSecurity Pvt. Ltd.
We’re honored to be associated with Zimbra for over years. Started with hosting a few thousand mailboxes of small & medium sized business enterprises, we’ve grown the business exponentially becoming the Top Platinum Partner in the ASEAN region catering to as many Government owned PSUs, BFSIs & so on Zimbra from Logix is one of the most widely adopted Email & Collaboration solution by Indian enterprise. Being trusted by more than 5,000 companies and PSUs with over 100 million end users, in 140 countries. 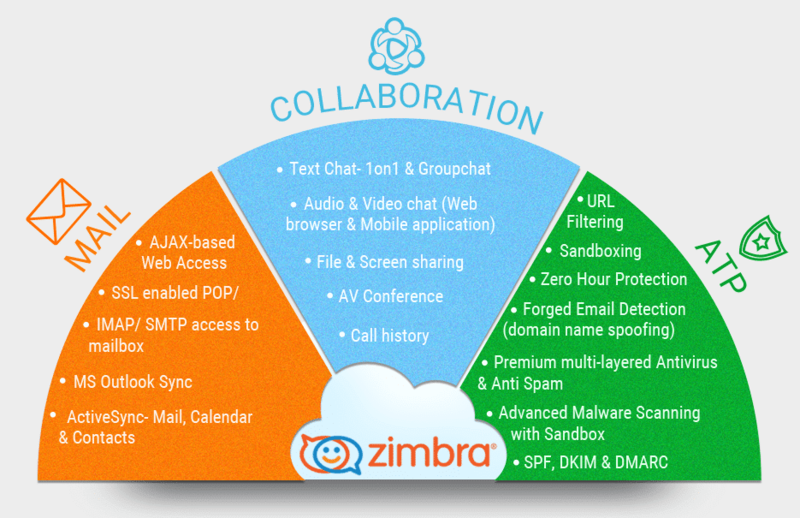 Zimbra Collaboration Server is third largest messaging platform after Office 365 & G-Suite. Email Security Advanced Threat Protection services are bundled with Zimbra which safeguards against all emerging advanced threats like Malware, Domain Spoofing, Cousin Domain Spoofing, TLS Encryption, Ransomware, BEC, Spear Phishing. Zimbra is a complete enterprise email & collaboration solution consisting of Mail, Collaboration & ATP features offering the most innovative messaging experience available today, connecting end users to the information and activity in their personal clouds. Business enterprises have the flexibility to choose the deployment based on their requirement. Cloud Zimbra can be easily deployed on Logix cloud infrastructure which is hosted in four, tier III data centers in Mumbai, Pune & Bangalore, making it easy for IT to deploy, manage and scale at dramatically lower costs compared to other solutions. An integrated enterprise-class messaging platform, using Zimbra as the core mailing solution bundled with premium email security, mail control features, email archiving, administrative control panel & mobility feature. The setup being hosted on performance- driven Dedicated servers on Logix Cloud hosted on Tier 3 data centres with proper redundancy. Hosted in-house on customer’s premise, over half a million mailboxes for numerous Business enterprises from Banks & FIs to Government entities. In every Organization Management teams have different Messaging needs than Functional heads & general users. Cloud Zimbra – Office 365 Hybrid setup on Logix cloud gets you the best of both worlds by letting you choose Cloud Zimbra for a set of users and Office 365 for others, sharing the same domain & GAL, thus lowering the TCO up to 54 %. Similarly, business enterprises can decide to allocate Cloud Zimbra to a few users and G Suite to a few in a Hybrid setup sharing the same domain & GAL within the Organization. Control panel is an internal team effort of Logix which is basically built to ease the administration task which is not included in native Zimbra. It acts as a single repository for users which makes it easier to search from the LDAP, one can search users on the basis of LDAP Schema parameters i.e First name , Last name , Dept , Designation , Location , Employee Type , Company Name & Employee No. Admins can easily Add/Delete or Mass Add users, they can also export the user list in csv format. It allows to Change/ Edit Account Information such as Personal Info, Address, Contact & company details of an Employee. Admins can create Distribution List, add/delete member from the DL, Add/ delete Auth Sender, Export DLs in csv. Access is allowed and the levels of permission are Read Only, Domain Edit & Super Admin. Logix control panel allows admins to change passwords, adding vacation responders, alias & forwarding email ids for users. They can also change account status to Active/De-active & Disabled. White List/ Blacklist domains/ Email ids can also be easily updated & managed. Mailbox properties like Enable/ disable Password policy, set Incoming & Outgoing Mail size restriction, Enable/ Disable Spam notification alert, update Class of Service, Update, quota can be updated in Logix Control Panel for Zimbra users. Reporting is another exclusive feature, download & extract Admin Activity Log, Statistics Report, Displays Data Transfer, Statistics report, Top sender and Top recipient month wise. Admins can investigate Incoming & Outgoing mail tracking from the control panel. The spam notifier mail which consists of all mail headers which user was supposed to receive but have got quarantined as they are identified as Spam Mail is sent to the Admin from time to time. It also has the Spam Release Function which allows users to release falsely identified mail by credentials provided to them. Zimbra offers sophisticated email, calendaring and collaboration features, but is less complex to deploy/manage and is as much as 50% less expensive comparatively. Zimbra enables high availability through support for virtualization. By providing a rich, consistent user experience on all major platforms (Windows, Mac, Linux)—online through a Web browser (Firefox, Chrome, Internet Explorer, Safari) and via MS Outlook, Thunderbird and other desktop clients—Zimbra increases end-user satisfaction and reduces support costs and user training needs. IT administrators can easily connect Zimbra to a unified communications solution to provide integrated click-to-call, voicemail, chat and presence for users. Zimbra has an easy-to-use Web-based administration console enabling IT administrators to securely access the application anywhere, anytime. Zimbra also empowers end users through end-user self-service administration, reducing IT administration and support overhead and increasing end-user satisfaction. It supports both hierarchical storage management and multitenancy. We perform a thorough Gap Analysis, understanding user’s functionality & needs, aligning it with Customer’s business requirement. Thereafter, proposing the Best fit for the users. L1 / L2 Support is provided for Office 365 Services 24*7, by certified engineers of Logix. *Support is available for VHA only. Password Age Policy By default password age is set to 30 days, users receives 3 notifications before the password is expired. Mass Upload Admin can quickly upload the users in bulk. Plan Change Admin has the option to upgrade the user from Basic to Professional without actually having to delete the user. Permitted Recipients Support Ticket to be raised Restrict Users/Groups to send/receive mails only from certain specified external domains Ex. User A allowed to send/receive only from local & abc.com email ids. Email size restriction Support Ticket to be raised Set User/Group wise mail size restriction to send/receive mails Ex. User A allowed to send 2 mb while User B allowed to send only 3 mb of email size. Block List Support Ticket to be raised Restrict users from receiving mails from few domains. Wiretap Content Support Ticket to be raised Specified words or phrases found in mail, action of redirecting or copy of the mail can be re-directed to monitoring ID. For all the above policies support ticket needs to be raised through Logix ticketing system. Reports Quota Report Displays mailbox Quota Allocated & Occupied by the user, report can be export in csv format. VNC talk is full feature real-time enterprise communication tool including chat, video/audio conferencing, screen sharing, voice messaging & file sharing. Available as a web, desktop & mobile client.